So it turns out that of all the 21 Secrets “Make a Mess Magic” spreads that I did, I love the purple and yellow combination the most. 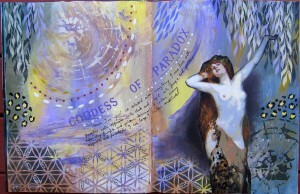 Here is my finished spread, which I called “The Goddess of Paradox”. As with all my blog posts, click on the image to see a larger version. I’ve been scrolling the net lately for paintings which are out of copyright and it just so happens that I adore old paintings anyway, especially 19th century paintings with women or goddesses in them! This one spoke to me about how relaxed she feels about living with Paradox (she does look relaxed doesn’t she!!?) and about how she contains multitudes and many opposing contradictory characteristics, and she’s fine with that. 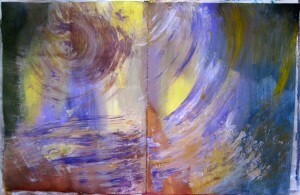 And so am I.
I include here my process: first I made a mess using purple and yellow paint. Not only some interesting shades of brown but also some olive greens emerged, who knew? Then I did some stencilling in a dark olive green and a very light yellowy white. I started to love the page at this point. I searched my images of paintings and found this wonderful woman who had some pale purple tones on her body and i knew she was perfect. I sponged a darker area underneath where I was going to stick her, so she would stand out and also tone in better to the background. 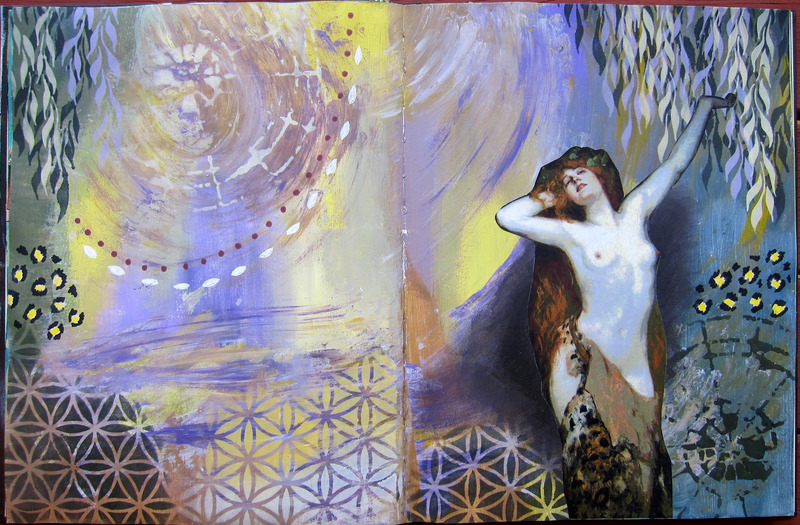 Finally I dialogued with her to find out what she wanted to tell me, just as I do in SoulCollage, and with most of my art journal spreads. 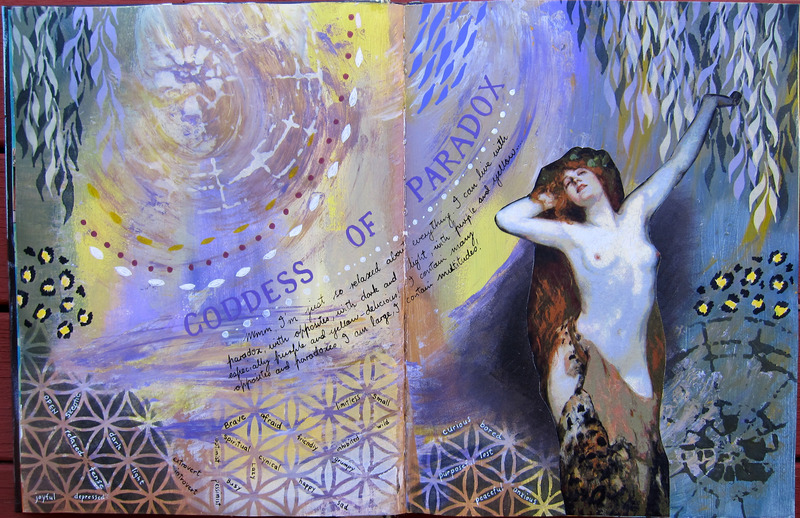 She said she is the Goddess of paradox and she got me thinking about how I have many opposite characteristic as part of me, so i wrote some of these in tiny letters amongst the Flower of Life stencilling across the bottom of the page. 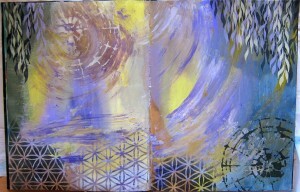 I guess we all contain multitudes, I suspect you do too! Thanks for visiting my blog, here’s a bit of Walt Whitman to finish: “Do I contradict myself? 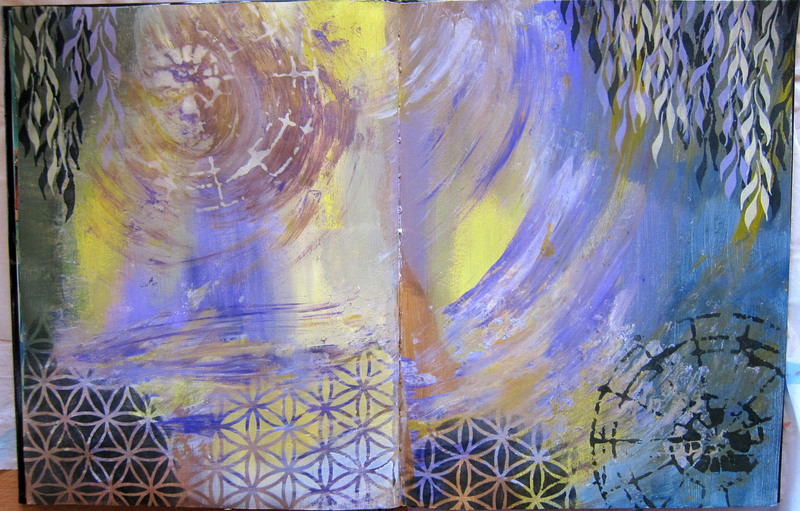 Hi, my name is Alison and this blog is where I talk about my art journaling, and occasionally about SoulCollage. Please feel free to comment on my posts and make suggestions!